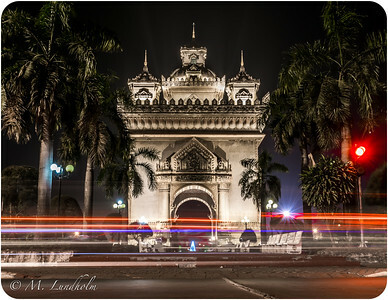 Evidence of its history as a former French colony can be seen all over the place in the major cities of Laos. 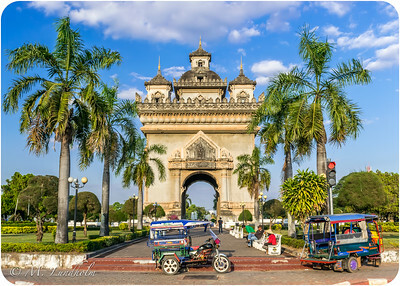 Doesn't Patuxay, or "Gate of Triumph," remind you of a similar arch in Paris? 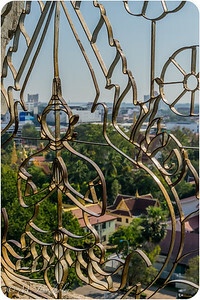 The monument commemorates those who died serving their country in the prerevolutionary wars. 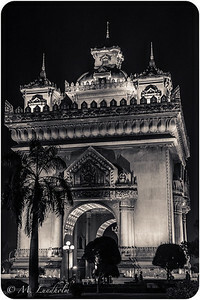 Interestingly enough, it was built with concrete donated by the U.S. that was intended to be used in the construction of a new airport. 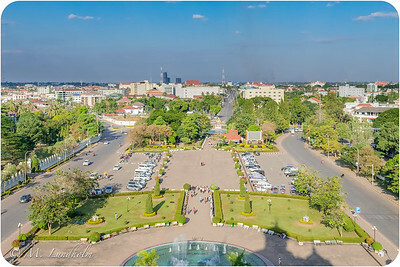 Three major roads radiate out from the northern end of Patuxay Park. 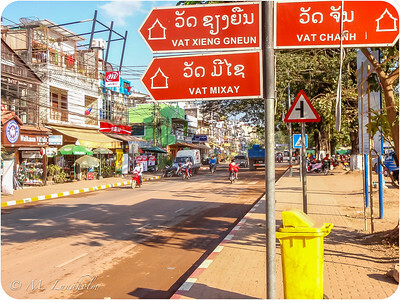 This road runs along the banks of the Mekong and marks the southern edge of the city. 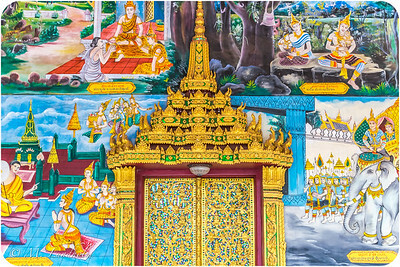 Anyone who has the 2017 edition of the Lonely Planet Laos travel guide might recognize this colorful door from the front cover. 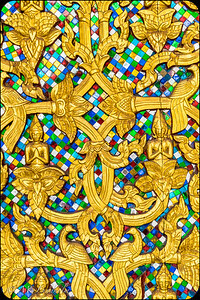 Close-up of the mosaic tiling on the temple door. 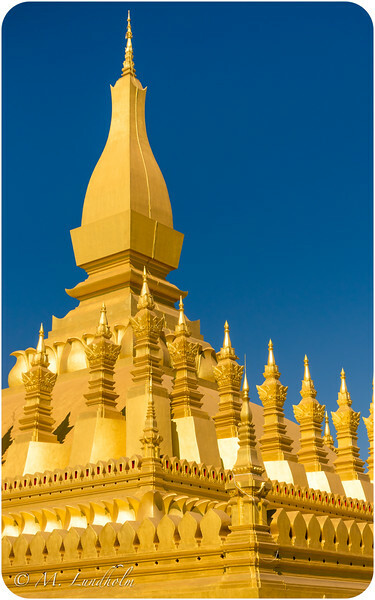 This golden stupa is regarded as the most important national symbol of Laos. 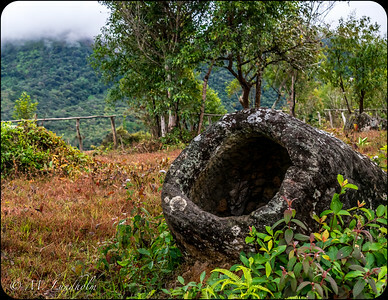 The earliest physical remains found on the site are from a 12th century Khmer monastery, but legend has it that Indian missionaries first built a shrine here in the 3rd century B.C. 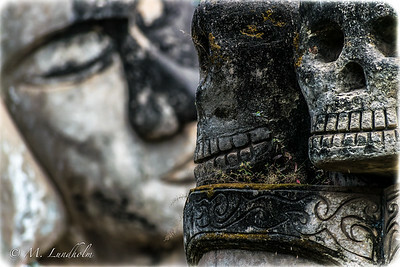 to enclose a breastbone of the Buddha. 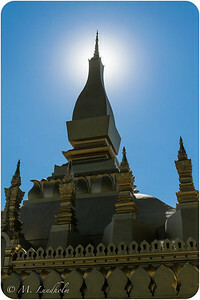 The stupa has three main levels. 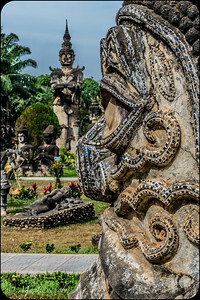 Each one contains different architectural features that highlight various elements of Buddhist doctrine. 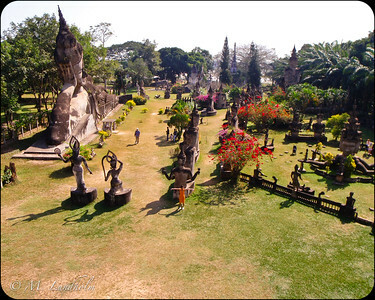 Visitors are meant to contemplate the meaning of it all as they walk around it in a clockwise direction. The structure you can visit today is a French-directed reconstruction from the 1930's. 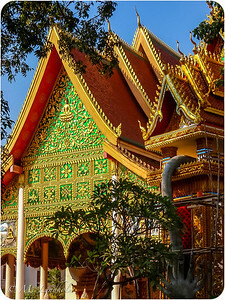 It was regilded in 1995 to celebrate the 20th aniversary of the Lao People's Democratic Republic. 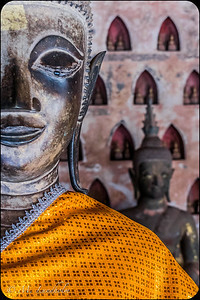 Wat Sisaket is Vientiane's oldest surviving monastery. 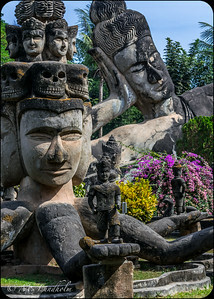 The inner sanctuary displays nearly 7,000 Buddha images (most of which are only a couple centimerers tall) that are paired together in triangular niches along the wall. 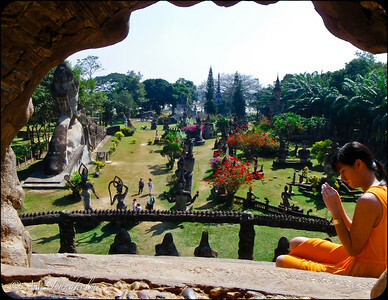 This tiny little park is jam-packed with Buddhist and Hindu sculptures. 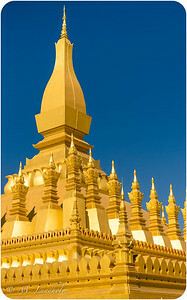 It sits on the northern bank of the Mekong River about 25km outside of Vientiane. 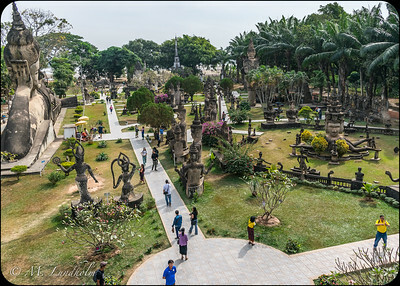 ... and here you can see quite a few more tourists, as well as development in the form of stone walkways and landscaping. 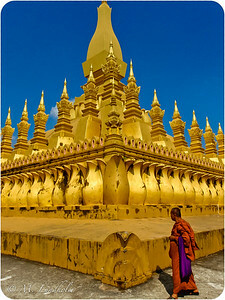 Laos is really starting to make a name for itself when it comes to travel in southeast Asia! 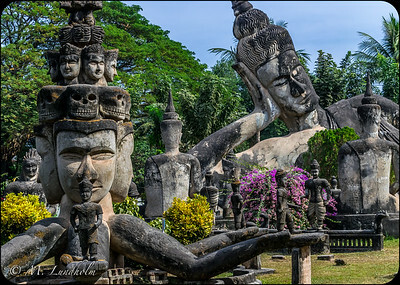 Laos is the most heavily bombed country in the world per capita. 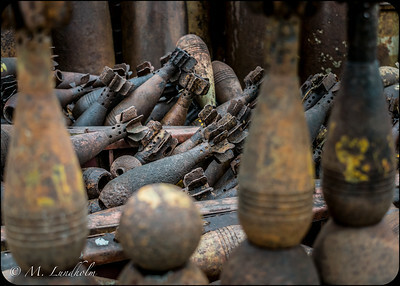 These are the kinds of ammunitions that are still being unearthed to this very day, some 50 years after they were first dropped. 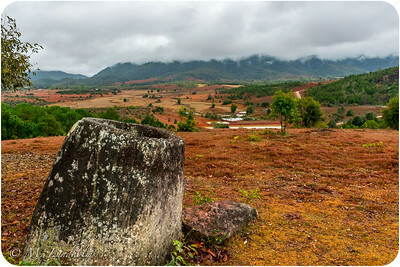 The area around Phonsavan was especially hard hit during the war, and the evidence is still clearly seen just to the east in the village of Ban Khai. 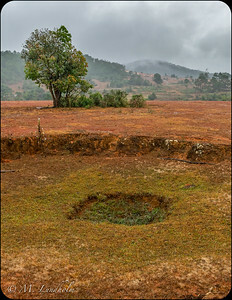 Here, the hillsides are pockmarked with craters left over after B-52 carpet bombing runs. 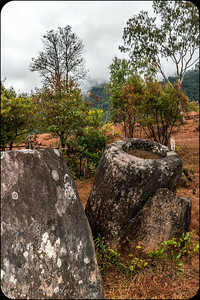 The hills around Phonsavan in central Laos are littered with giant stone jars of unknown ancient origin. 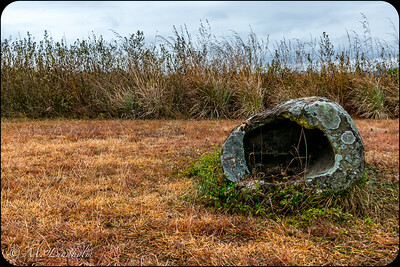 The area was also the target of intense carpet bombing during the Vietnam War. 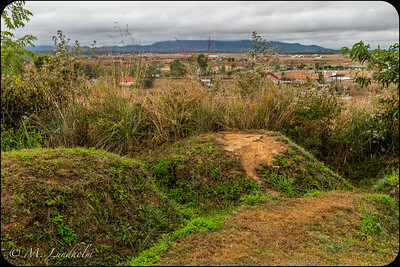 As a result, only 9 of the 90 recorded jar sites have been cleared of unexploded ordinance, and only three of those are regular stops on the main tourist circuit. They are, creatively enough, known as Jar Sites 1, 2, and 3! 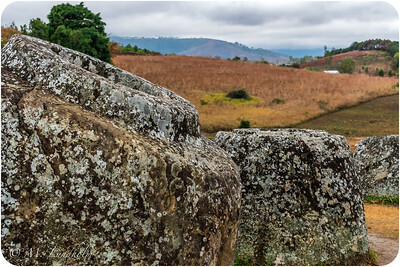 Visiting the Plain of Jars sites isn't always an easy task, but it's well worth the effort! 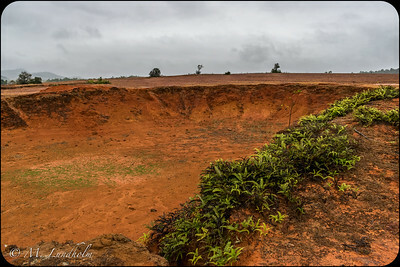 Dirt paths and rice paddies turn to mud on rainy days, but they also offer some spectacular views as you make your way to the jars. 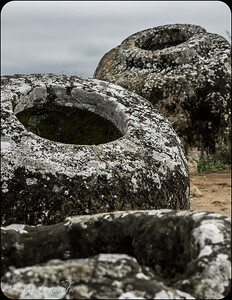 Archeologists estimate that the jars date from 500 B.C. 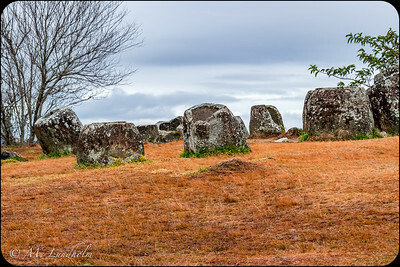 to 200 A.D. One theory suggests that they may have been used in eleborate burial ceremonies. 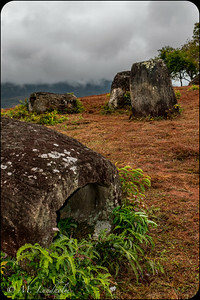 No one knows for sure, though, why they're scattered across the hills, let alone who put them there in the first place. 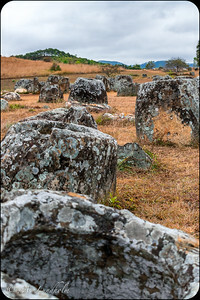 HAI JEUAM, the jar in the background, is the biggest at Site 1. 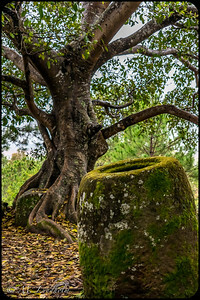 It weighs six tons and measures about 8 ft. from top to bottom. 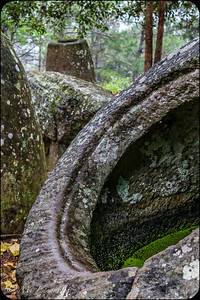 These are trench lines left over from the Laotian Civil War (1953-1975). 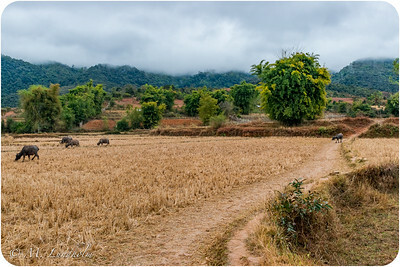 The mini-van ride between Phonsavan and Luang Prabang brings you up and over some incredible mountain vistas. 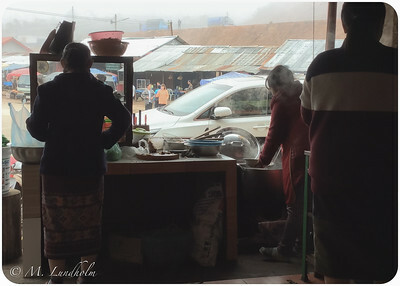 This photo was taken when we stopped for lunch at a small road junction that was so high up that the clouds floating by made everything seem like it was in a haze. 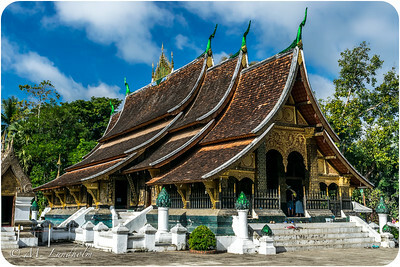 Easily the most impressive of Luang Prabang's many temples, this is considered the best example of classic Lao architecture. 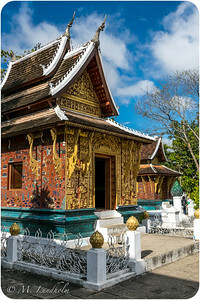 This building, the "Red Chapel", sits just to the southwest of the temple's main hall. 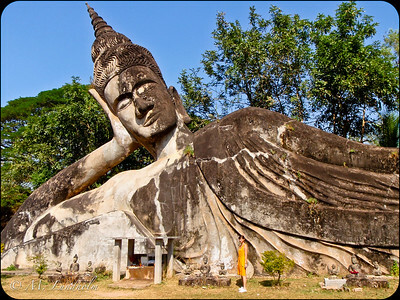 It houses a 2m image of a reclining Buddha that's considered to be one of the most important in all of Laos. The mosaic tiling covereing the building's exterior depicts scenes from daily Laotion life. I have no special insight to share here. 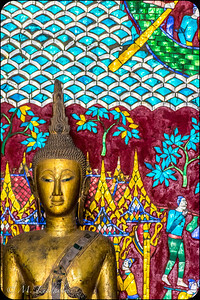 I just thought the Buddha statue sitting in front of the mosaic tiling made for a beautiful image! 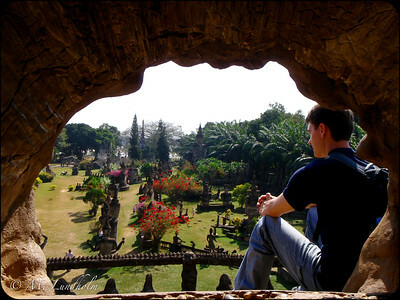 This photo was taken inside the Carriage House on the grounds of Xieng Thong Temple. 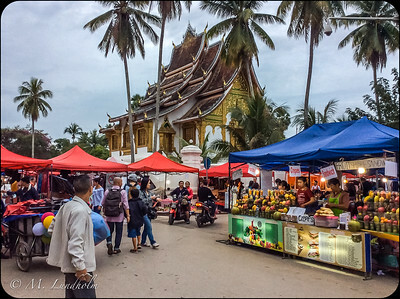 It's tradition for all Lao male Buddhists to serve as monks at some point in their lives, even if it's only for a short period of time. 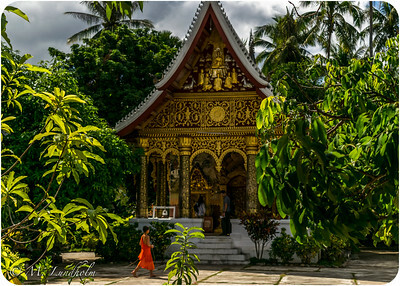 Seeing them move to-and-fro in their orange robes is a farily common sight when visiting these temples. 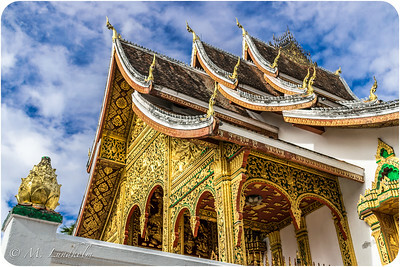 This beautiful building sits on the grounds of the Royal Palace. 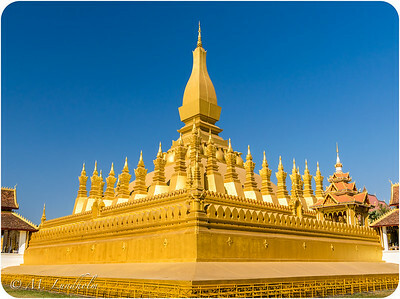 It was built to house Luang Prabang's namesame, the Pha Bang Buddha image.